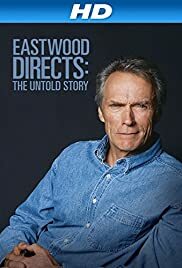 As Clint Eastwood hit his mid-eighties, Richard Schickel directed his third documentary on the actor-director-producer-music writer. It takes the usual form of these documentaries, a series of talking heads, the actors and writers and other talents he has worked with. It's a pretty distinguished list of colleagues and Schickel has finally gotten the point of his subject. Clint Eastwood is a professional and those who work with him recognize it. Like the talent of the Studio era of movie making -- he arose during its decline and demolishment -- he doesn't boast of artistic vision or important messages. Eastwood finds projects that interest him, works with people he can respect and doesn't make a fuss in the process. That quiet sense of competence and trust infuses his productions with a smoothness that astonishes and enraptures the people he works with. What the movies shows without saying directly is the intense taste and intelligence with which Eastwood makes movies. His seemingly lackadaisical attitude towards the box office results is belied by the excellence and commitment shown in his work. Does every movie he works on succeed? By no means. However his workmanlike attitude and his frequently compelling work make him one of the few solidly middlebrow movie makers still working and this documentary shows us why.